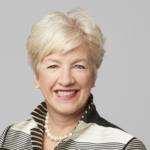 Annette Verschuren is Chair and CEO of NRStor Inc. She started her career at Devco, working in coal mining for 9 years before she left Cape Breton Island for Toronto to sell crown corporations for the federal government at the Canada Development Investment Corporation (CDIC). She then became president and co-owner of Michaels of Canada, a chain of arts and crafts stores, where she opened 17 stores in 26 months. She later became president of The Home Depot Canada and Asia, overseeing the growth of the company’s Canadian operations from 19 to 179 stores between 1996 and 2011. She also led The Home Depot’s entry into China. She is a member of the Canadian Minister of Global Affairs’ new NAFTA Council and sits on the federal government’s Science Technology and Innovation Council. She co-chairs the Smart Prosperity Initiative, which is mapping out a course to a stronger, cleaner economy for Canada. A champion of community investment and volunteerism, Ms. Verschuren serves as Chancellor of Cape Breton University and chaired fundraising efforts for the University’s new Verschuren Centre for Sustainability in Energy & the Environment (VCSEE). Annette Verschuren recently wrote a business book “Bet On Me”, leading and succeeding in business and in life, published by Harper Collins. NRStor Inc. is a privately held Toronto-based energy storage project developer and owner focused on accelerating the development and construction of industry-leading energy storage technologies. NRStor partners with progressive stakeholders and leading energy storage technologies to build, own and operate commercial projects in order to deliver better energy storage solutions. TheFutureEconomy.ca: Canadian competitiveness in the post-Paris global economy: good or bad? Annette Verschuren: Good. We are part of North America so what I see is an increase in international students coming to Canada and investors looking at Canada as a place to step into the North American market. I think we have a big advantage and our position on climate change and the reduction of greenhouse gases can give us the opportunity to be more competitive in this market place. I travel a lot and Canada’s name and trademark are very strong right now. People seem to like Prime Minister Trudeau and I think that relative to the US, Canada is increasingly seen as the place on our continent to do business from a social and from an economic perspective. I personally think that profits and purpose have to go more hand-in-hand and that sustainability has to be a greater factor as we look at our investments in all institutions. The federal government seems committed to boosting Canadian entrepreneurship and innovation. Are we on the right track to reach both economic and environmental goals with the current policies? I think Canada’s economic goals are tied to environmental goals, so the jobs of the future will be in sectors like clean tech, advanced manufacturing artificial intelligence, food production, energy related companies or all kinds of traditional companies adopting cleaner and higher technologies to run their businesses. I actually believe the fact that we are going to be challenged to reduce greenhouse gas emissions will make us a more innovative country. We have had it too fat and easy over the years. Canada is a great country but what I worry about is our lack of productivity and our risk-averse attitude on many issues. So I think we need to take more risks in terms of staying committed to the Paris Agreement and reaching targets. I think it will only help Canada in the end and it will create the jobs that we need so badly. We are well positioned and I think the federal government is putting a lot of money into entrepreneurship and innovation. I only hope they do not put too much money in and that the money they put in is the right kind. Is venture capital the right kind of money? Venture capital and public-private partnerships make a lot of sense. I think leveraging the private sector is very important in terms of moving policy towards economic and environmental goals. NRStor’s strategy is to bring in the best available technologies to accelerate the development of large-scale energy storage projects. How innovative is this business model in Canada? There were very few investing in energy storage technologies in Canada five years ago, and that is why we started NRStor. We had to develop the market and take the risk of investing in new technologies, two of which being Temporal Power and Hydrostor, both Canadian grown companies. In order for them to move ahead they needed to become commercial, so we took a risk on those projects and those technologies. It is really important to develop new technologies but if you cannot get them into revenue-producing commercial entities, they simply die. So those are two of the technologies that we work with and we work with a lot of other battery technologies, including with Tesla’s residential storage batteries called Powerwall, as well as Powerpack, which is a larger, more commercial unit. In terms of business model, I think we are the only pure play energy storage developer in the country. There may be one other competitor from the US that has come to Canada and is doing similar work. But we are the first in the country and have done the first flywheel commercial installation and we are doing the first fuel-free case- compressed air energy storage project in the world in Goderich right now. So it is about taking risks and moving forward. I believe there are big application opportunities for these technologies in the world. We are also looking across the supply chain in terms of battery technology and we see lots of opportunities to build out the business and make the grid more resilient and more flexible. I see a movement towards redistribution of electricity, going more towards the communities and homes. You see that in people putting solar panels on their homes, installing batteries and buying electric cars. I am seeing a movement towards this and I see it accelerating over the last year or so, even in Canada. You recently raised $200 million from the (LiUNA) Labourers’ Pension Fund of Central and Eastern Canada (LPFCEC). How did you get them on board and how will these funds be used? We got both equity contribution and access to $200 million, or as much money as we need to make things happen. We intend to get this money moving with more verticals. The first one is building energy storage for utilities; the second one is building energy storage for heavy industry users to reduce their costs; the third one is micro-grids with Indigenous People; and the fourth is residential power installations. So we are playing along the whole electricity supply chain and storage is needed all along it. Storage should be seen as both a load and a generator. And when you have an asset that can provide both those services, it is much more flexible and it can do more things. By comparison, a gas plant can only go one way: it can only generate energy. We can take in the energy, hold it, deliver it, and generate it. So we think energy storage is critical to the future of all electricity markets around the world; there is going to be more and more decentralization, less reliance on the grids of the world, more micro grids, more redistribution of energy, and I think it is consumers that will drive that change. I think Elon Musk is doing a terrific job in driving awareness of what can be done and people are just picking it up, which is really quite exciting. You mention consumers and there is a lot of criticism of the financial burden Ontario’s energy policies is placing on them. What are your thoughts on that? In Ontario, 98 to 99% of the grid is fossil fuel-free, which probably makes it the most progressive jurisdiction in all of North America and I think that is great. Perhaps the execution could have been better but energy storage can help reduce these costs and we have to find ways to maximize performance. The other thing that is happening is that Ontario may have begun a little bit early. When I started five years ago, the average cost of batteries was about $1,000/KWH. Today it is down to about $400 and that has happened in just five years. So I see this transition of cheaper energy happening at the capital level for solar, wind and other technologies. Battery technologies are a big part of that and it is the integration of wind energy when it is windy at night and sun when you have too much of it during the day that is critically important. Once those costs go down, it will make a significant difference for the future. I actually think in 10 years time people will say ‘how in the world did we do anything without having energy storage assets throughout our electricity supply chain’. Do you spend a lot of time trying to influence policy and change regulation? Yes, absolutely. There is so much integration of government policy into the electricity market that we have to influence and educate decision-makers about what the opportunities are. My team of 20 spends about 20% of our time on that. When they are not working on projects themselves, they are working to advocate for better policy. You mentioned Elon Musk of Tesla. What impact do you expect the electric car to have on Canada’s energy market and energy mix in the coming years? I think the electrification of transportation is going to happen and it is not only the car but also much more of our transportation systems. Every city in our country is looking to install electric vehicles, looking to electrify its transportation system and looking at battery operated buses. That will have an enormous impact. I often talk to my colleagues about the acceleration of change and I think it is going to happen way faster than we think it will. So I believe the electric car and the battery are going to have an enormous impact on Canada’s energy market in the coming years. Again, it is being pushed by the need to reduce our greenhouse gas emissions, and transportation and buildings make up about 50% of the challenge. I think we are going to see this movement go very aggressively. Of course, some places will be slower to adopt electric cars, like rural Canada for instance, but overall, things are happening very quickly. What would be your top entrepreneurship opportunities right now? Do you believe Canada’s youth should start up their own companies? I love this question. If I could talk to all the young people in our country and I would say this to them: get a Science, Technology, Engineering, and Mathematics (STEM) degree and get some business experience. It does not matter if you work in a company or work in government, but really think about becoming an entrepreneur and really think about the opportunities the future holds ahead of us. There are opportunities in clean technology, healthcare and advanced manufacturing for instance. We are a nation of very smart people and we should find ways to build on that. We can improve our fossil fuel production, extraction and distribution and we can reduce the emissions coming out of the products we produce. I know we can do all of that, and so I would say we need to build more BlackBerries in our country. We should have 20 of them in Canada right now. We do have big companies that are working very hard like IBM, GE and great Canadian companies like Bombardier and Teck Resources that are doing a lot of things but it is not enough. We need to build companies, scale them up and keep them in Canada, instead of having them be bought by American or Chinese companies. That is what will give us the most secure future in our country. What are the top 3 qualities that you have developed and that you now live by in any business venture you embark on that you would recommend young entrepreneurs focus on? One of the chapters in my book is “Mediocre strategy and great execution”. I like to start things early and make things right as we develop projects and solve problems. I also take calculated risks and maximize the performance of my teams by engaging them early on projects and problems. So the top 3 qualities are: creating an environment that stimulates innovation and productivity, taking risks and getting things done.